Explore the railway all day with our Romney Rover ticket. Pre-book a seat on the popular 10:30 departure from Hythe Station (CT21 6LD) and stop off at any of the main stations. Use the railway at your leisure and return to Hythe at a time to suit you. It is a winner of TripAdvisor’s Certificate of Excellence and this world famous steam railway is one of Kent’s top attractions. The Model Exhibition at New Romney Station is a must-see attraction and entry is included with a valid Romney Rover ticket. Showcasing RH&DR memorabilia, past headboards and of course a working model railway. The interactive features are sure to keep the children intrigued, whilst displays depicting the railway’s history always engages the grown-ups. Please note: There are up to 40 pre-bookable seats available on this train. Should these pre-bookable seats sell out, customers are still welcome to turn up and travel on the day. The remaining 80 seats will not benefit from the 10% discount. Ticket valid only on date selected. Ticket must be printed and brought to Hythe Station on the date selected. Seats are only guaranteed on the 10:30 departure from Hythe. We regret that there can be no refunds for ‘no show’ customers. ALL booking alterations will incur a £5 admin fee. Cancellations notified in writing, at least 2 weeks before the booked date will be refunded less a £5 admin fee; shorter notice cancellations are not entitled to a refund. 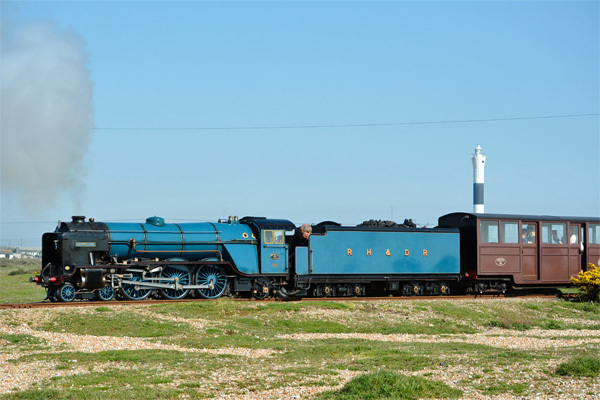 Romney, Hythe & Dymchurch Railway reserves the right to alter times and locomotives without prior notice. Wheelchair reservations can only be guaranteed by calling 01797 362353 2 weeks in advance.